De Sims 4: Update 1.29.69 beschikbaar! Vandaag is er weer een nieuwe update uitgebracht voor De Sims 4. Deze update voegt in het bijzonder de nieuwe PlantSim-uitdaging toe waarbij het de bedoeling is magische zaadjes te verzamelen. Hoe het precies in z’n werk gaat wordt hieronder kort uitgelegd, maar wordt ook wat duidelijker toegelicht in de community blog van vandaag. Verder zijn er weer best wat verschillende bugs opgelost zoals je hieronder rustig kunt nalezen. Are you feeling green? Ready to let the sun invigorate you? Do you see magic beans in your sleep? Is Jack your favorite name? Ivy? Or Audrey… too? Or maybe, you just have your own seed to bear… fruit to pluck… rings to count… er… plant related story to tell. Well, now you can, because the PlantSim Challenge has sprouted! Look, plant + sprout is a required pun, I really didn’t have a choice in the matter. Head on in to the game, and give Jasmine a call. She’ll tell you all about the challenge, and give you your very own Magic PlantSim Stump! Yes, the bottom part of a tree after it’s been cut down… typically dead. Yes, it’s not very eco-friendly. To continue… the Magic PlantSim Stump will hold the Magic Beans, that you get from talking with the PlantSims that wander around during the day. There will be 6 beans to collect (Uncomfortable, Playful, Confident, Angry, Sad, and Flirty), and will require that you get a PlantSim into the corresponding emotion to acquire. Magic? You’re going to say magic aren’t you? No. … I was going to say… the tree grow. Yep. Yea, the… Mystical Magic Bean Portal Tree. What about the Mystical Arcane Unknowable Magic Bean Portal Tree? 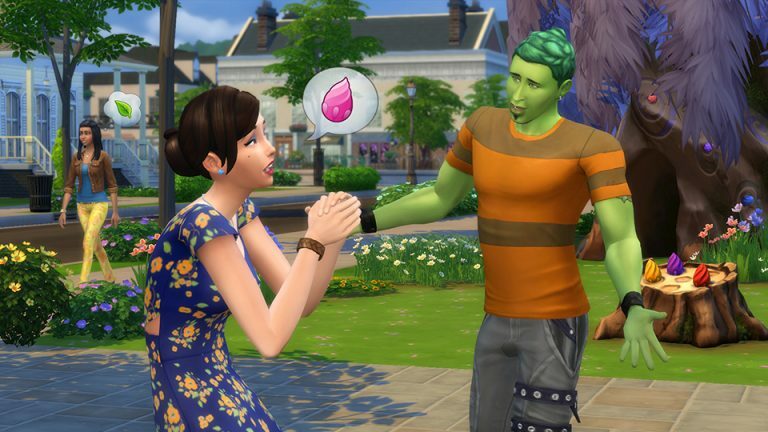 … a portal will open once a day, where you can send your Sim, and find the Forbidden Fruit. It is magically delicious fruit? Ok, fine! Eat the fruit, you’re a PlantSim for five days! You no longer have to worry about bladder, but you need sunlight and water to survive, and you get a bonus to your gardening. Woah, woah… woah. Only five days? Sims aged up from toddler to adult, will now have an appropriately sounding voice. I used to write the word ‘toddler’ and this giant censor would appear out of nowhere. Still getting used to it… toddler? Just checking if the censor is still there. We fixed an issue that could occur when re-loading a lot, that would prevent exterior puddles from disappearing. Exterior water puddles will once again disappear over time. Speaking of which… do you change the clothes of your Sim after a bladder fail? Or do you just let them shake it off? We addressed a clipping issue that occurs with yfBottom_GP01ShortBucklet when paired with certain shirts. Is clipping an inside baseball term? Is inside baseball an inside baseball term? Well, essentially travel… you can’t travel. Now you can… visit your friends, or go h… er travel. We also addressed an issue that could lock you out of your own home upon returning to your lot, if it has a vampire skulking about. And yes, skulk is the proper term to use when an individual is hanging out on your home lot hoping to take a bite from your neck. If they were seeking a little TLC, the proper term would be Creep. If they sought to break into a maximum security prison where a world leader had mistakenly taken refuge, the proper term would be Snake.